4 photographs : col. ; 10 x 15 cm. This file consists of photographs from the speed skating event at the 1994 Alberta Winter Games in St. Albert. 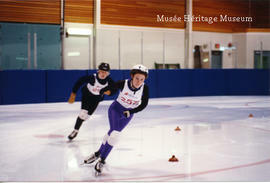 Photographs depict the speed skaters on the course at Troy Murray Park,Campbell Arena, and the medal winners. Photographs were taken by Maryann Peterson.